← Political Campaigning, Just How Far Will They Go? Hello. 🙂 Halloween is just around the corner and I’ve had this cute little Tiddly Inks witch colored on my table, just waiting to be put together. Since I have a marathon of posts coming up beginning Friday, I thought I better get to it now. Other than the big piece of plaid, the patterned strips and blocks were leftover scraps from Cosmo Cricket’s Matilda paper pad. I got the idea for the little face on the pumpkin from one of the other patterns in the pad. I love the little “stitched-ish” smile. As usual, my image is colored with markers, and then the ground and bits of shading were added with pencils. Thanks SO much for stopping by! (And if you’d like to make me feel better, feel free to share one of your own stupid moments. lol.) Have a great day! Digi-image: Tiddly Inks “Peekaboobug” Sentiment: Lockhart Stamp Co. “Witchie, Witchie” Ink: Memento Tuxedo Black, VersaMagic Wheat Cardstock: Papertrey Ink Vintage Cream, Black Patterned Paper: Cosmo Cricket Matilda 6×6 paper pad Accessories: Copic markers (E000, E00, E31, E33, E35, E57, YR0000, YR00, YR23, V15, V17, W1, W3, W5, W7, G94), Prismacolor pencils, black Sakura 3-d glaze pen (over pumpkin eyes), sewing machine, black ribbon scrap. Finished size 5” x 5”. Oh, geez, there’s another one for you. I got so caught up in my stupid moment that I forgot to tell you how absolutely adorable your card is! lol I love it! So cute and your coloring and stitching are just beautiful. What a cute card! Love the funny post! I’m forever doing stupid things! I think it’s a mom thing. My sister, who doesn’t have any kids, isn’t at all absentminded, forgetful, whatever you want to call it! But me?! Well, I’m just like you! I was just talking to my mom the other day about this one movie that I can’t wait to come to theaters, and we just saw a commercial for it, and I had no idea what the name of it was! Then, today we were eating lunch, and my dad happened to mention Secretariat, and it was like a lightbulb turned on! THAT was the movie I was trying to think of! DUH!!!!! But, I’ve left milk out all day, left a candle burning after I’ve left the house for the afternoon, lots of crazy stuff! LOL! I love your card; adorable as always and thanks for the laughs! Hmmm…WHICH dumb moment should I share with you? THEN in my 3rd pregnancy, I locked the keys in the car with it running – oh yeah, I’m amazing. First off… LOVE the card!!! LOVE this card!! 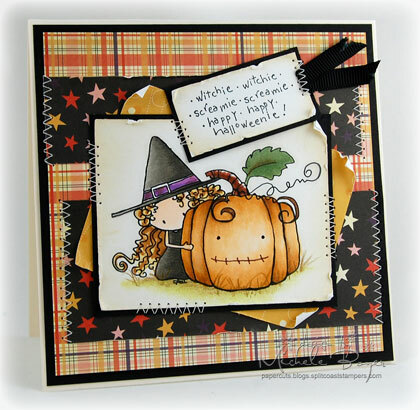 Love all the papers and the layout and especially that adorable face you drew on the pumpkin – just perfect! BTW – I’ve totally sewed my whole card shut before too! And I fixed it exactly how you did and got a really fat heavy card! I make mistakes with my cards all the time, but as long as I can fix them, it’s all good! Cuter than cute! Love it! hehehehe! oh i have days like that more than i care to admit…except i have NEVER stiched a card together! LOL! 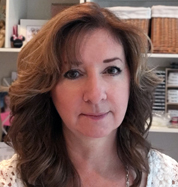 Sorry about your rough day Michele! Believe me, we have all been there. That crockpot one – I have done that! Soooo frustrating!!! Anyway, I love your gorgeous card! This image is just too adorable!!! Cutie witchie card! Ooh…bad day. Wish I could forget this one, but one day when I was not awake yet (I am so not a morning person), I saw my husband had left his cell phone on the counter. Being the helpful person I am, I picked up the phone & called him. Duh…the cell wrang in my hand. We could all write a book with those “senior moments”! Oh this is so adorable! Love the creative stitching! Your coloring is also perfect! That crock-pot thingy happens to everyone at some time or another! Oh how cute!! 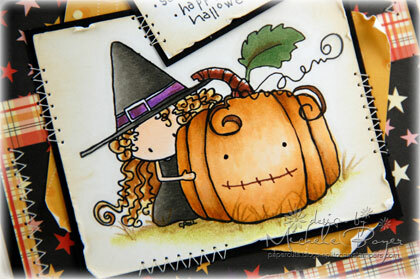 This is one of the sweetest Halloween cards! Love it Michele! LOL, love it, I’ve done the same thing…and many other things! 🙂 CUTE ADORABLE card, love the cute pumpkin face! Too funny…I think we’ve all done that!! I’ve added piercing and brads all the way through a dozen times!! Love this! !